Easy fashion flat over knee boots in soft shiny black patent. Versatile enough to wear for all sorts of occasions, casual, fun or outdoor. They are a pull-on boot with an inside zip. The boots have a sleek line and are open at the top at the back of the knee with a short elasticated section for extra comfort when moving. Cheethah print fabric lining. NOTE: Designed for a slim/standard leg fitting. Made by Possh!. Please see our Product Description below for full details and important sizing information. Turn heads with these very stylish high heel over knee boots. They are made in black soft suede and have a leather top which is open at the back to show a deep red lining. The boots have a strong 3.5in needle steel stiletto heel and pointed toe. Wear with leggings or short mini skirt. By Gucinari, makers of fine footwear. These boots also come in a classy presentation box. Please see our Product Description below for full details and important sizing information. For partying, playing, for fun, try these strikingly sassy high heel Pleaser thigh boots in very smooth shiny patent material. Wear with a really short skirt, hot pants or leggings. By Pleaser USA, you can be assured of well-constructed footwear that is innovative and great quality. 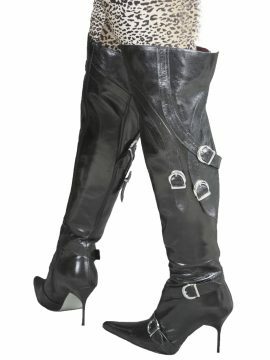 These thigh boots have a 6in stiletto high heel and a mid platform sole which gives the foot a more gentle elevation. A round toe and good arch support also make these boots more comfortable. Designed as a standard/slim fit on the leg but an elasticated insert on the thigh gives a little more room at the top of the boot. Please see our Product Description below for full details and important sizing information.